Mix all ingredients except panko. Place chicken into 2 qt. casserole dish, Pour marinade over top of chicken making sure all chicken is covered. Cover and refrigerate for 2-4 hours. Remove cover and use a brush to repaint the chicken. Liberally sprinkle panko over top of chicken. Bake uncovered at 375 degrees for 1 hour or until chicken reaches internal temp. of 165 degrees. Now it is your turn to show off what you are proud of. 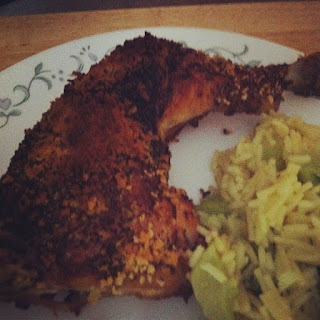 I am a big fan of chicken so it is always great to see a chicken recipe. Thanks for hosting and Happy New Year!